This history was compiled in part, around 1980 by Walter E. Clark, deacon, educator, and community leader. It encompasses information collected from many of the long time residents of the community, but chiefly from Mr. Albert Ezell a long time resident, church records and court house deeds. I Cleveland Sowell completed the search of the deeds and the location of the church in 1889. We will begin with the present and walk backwards in time. Springhill held its Dubose street groundbreaking ceremony on August 31, 2003. It was dedicated on May 29-30, 2004 under the leadership of Rev. Leander Bridges, and trustees Dwight Gaines, Robert DeLoach, Sr., Michael Clark, Greg M. King, William McCormick, Reginald McMillan, Billy Moffett, Terry D. Moffett, Sr., George Newell, Fredrick Pearson, and Michael Sargent. Many reforms have been instituted and much has been added to the church property. Rev. Bridges became pastor of Springhill on September 19, 1984. From September 1977 until July 1984. Springhill was guided by Rev. Sam McDonald Jr. Springhill was the first church to call Rev. McDonald after his ministerial ordination. Many needed improvements were made under his council, including church furnishings, inside baptizing pool, central air and heat, and much more. Prior to Rev. McDonald, the pastor was Rev. Irvin Gilmore. His pastorate was from October 1974 until July 1977. From late 1972 until mid 1974 the pastor was Rev. Leon London from Hattiesburg, MS. Rev. London died of cancer in 1982 at the young age of fifty-one. Reverend Justice C. Bean was the pastor from May 1971 until sometime in 1972. It was in 1972 when the churches tower was removed, and the church was remolded to its present form. Reverend B. J. Hines was the pastor from April 1952 until his passing on May 11, 1971. Rev Hines was born in 1889. Reverend C. J. Martin was pastor from 1947 until 1951. Reverend E. L. Thames was the pastor from January 1946 until January 1947. He also pastured in Meridian, MS., and St. Louis Mo. Reverend Thames was living in California when he passed away. Reverend E. B. Woods was pastor from 1940-1945. Reverend G. C. Wells. The date of his calling to Springhill was not found. We are sure though that he was the rebuilding pastor after the infamous fire of 1936. A Corner stone that was never laid indicates that the builder was deacon Roosevelt Mizell, a member of the church. The fire started in the home of Mr. And Mrs. Joe and Lessie McGilberry who lived across the street from the church. The fire leaped across the street and caught the church and the homes of Mrs. Mary Moore and Mrs. Matt Johnson. The organ and a few items were salvaged by the swiftness of a few women. Our history reads that with sincere prayer and dedication, Springhill was rebuilt within the same year it burned. Reverend Joseph D. Davis. Date of Rev. Davis' service is unknown at this point, but evidence seems to indicate that he was pastoring in 1935 and probably as early as 1932. Reverend Johnny Pierson, more popular called Rev. John Pierce. Again, much of the history was lost to the fire including the ending date of rev. Pierson's reign. We do know he was the pastor in 1932 when deacon Gilbert Conner, and Sunday school books put him as early as 1927. A Sunday school record from January 8, 1928 reads that the school was opened with prayer, and classes one, two, and three were taught combined. Total attendance, 20. Total collected $1.01. School reviewed by pastor John Pierson. Reverend W. C. Taylor – 1908. Rev. Taylor was from Shubuta, Ms. 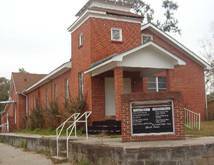 The church was rebuilt at its present location 509 Grady St, Ellisville, MS. The land was donated by Mrs Alice L. Myer, Alma Myer, and Josephine Collins. White citizens of the community who were concerned about the continuation of the Christian plight for black people of the area. The land was to belong to the church and it's official and their heirs, so long as it continues to be used for Church purposes. Reverend E. B. Buther – 1902. There were other Ministers associated with the church prior to 1902. They were Reverend's B. F. Williams, Waters, and Taylor. In September 1902 (see deeds), the trustees of Springhill Baptist church colored deeded its property to the Ellisville and Laurel R.R. Co. for a right of way. The trustees were Luther Simpson, John Wilson, Rich Moore, John McDonald, and W.M. Cochran. It was agreed to in the deed that the Ellisville and Laurel R.R. Co. shall take up and decently remove and rebury all dead bodies buried upon said land at such places as the relatives of said dead bodies may select within the corporation limits of Ellisville. It is not known if any bodies were moved, or if there were any bodies to be moved. No records were found concerning the Ellisville City cemetery number two (the black cemetery) on Dubose Street. A deed from John H. Bynum, to Ellisville colored Baptist church. (This is the same property as above.) It was witnessed and signed by John H. Bynum and M.A. Bynum on the 19th of June 1893 (see deeds), and was notarized on July 17th, 1902, and was filed for record March 20th, 1901. There is a discrepancy in the dating of this deed. In June 1889 (see deeds), Mary McManus deeded a lot to Springhill Baptist Church. The property was located two blocks east of Collins St., and on the South side of Magnolia St. in Section 3. This property was in the path of a railroad, but no deed was found as to where it was sold to the Ellisville and Laurel R.R. Co., or to anyone else. The church may have been organized prior to 1889. 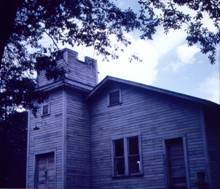 Church services could have been in private homes, or in what was called a brush arbor church. A brush arbor is clumps of trees and bushes gathered together to form a shed for protection against the elements. No history can be complete without the mention of those who made the events of this history possible. To the organizing deacons, we owe homage for their foresight in beginning this great heritage. We honor brother's, Dennis Hessler, Peter Nance, John McDonald, Frank McWilliams, Frank Jordan, Rufus Simpson, B.W. Washington, Joe Williams, Jim Walker, Jim Pitts, Edmond Byrd, Marshall Morgan, Alfred Cooley, George Heidelberg, Isaac Everett, David McWilliams, Crawford Halsell, Roosevelt Mizell, Sanford Smith, Rich Currie, Willie Jones, Luther Delk, Gilbert Conner, Millard Barnes, Clayton Everett, and others whose records were lost in the 1936 fire. Pianists and organist included: Sister's Estelle Heidelberg, Lula Abrams, Betty Faulkner, and Daisy Hawkins.